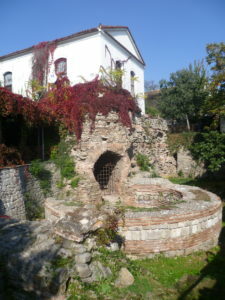 Hisar Kapia, the 11th century gate to the old town of Plovdiv was built on top of the old Roman Gate. Plovdiv became part of the Ottoman Empire in the 14th century and you can see the medieval Ottoman houses embedded in the old Roman walls. You can also see the remains of several Byzantine towers dating back to the Emperor Justinian (6th century AD) just inside the old town. 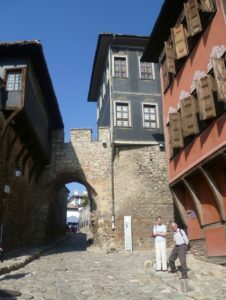 Part of Plovdiv’s fascination is that its history is piled up higgledy-piggledy and the traces of its past are still there. Footings of a Byzantine tower dating from the reign of the Roman Emperor Justinian. 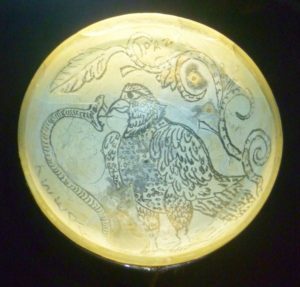 However, what I really want to look at is something discovered accidentally in 1983 when workmen excavating a proposed underpass came across a Roman villa complete with mosaics, lead piping, and the original city street, as well as some extraordinary glassware. Two heads. Who do they represent? It is now called the House of Eirene and it is part of the Trakart Museum. It’s all a bit ad hoc. You plunge down beneath the modern city to a large dim cavern with precarious wooden planks which go round on a ledge above the mostly geometrical mosaics on the floor. You have to watch your step. Bulgaria was converted to Christianity in AD 864 and there are examples of Christian iconography in the mosaics. 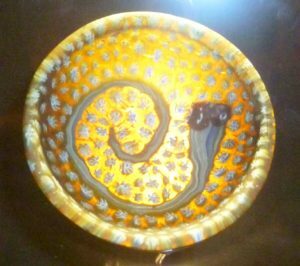 In the small museum, there are a some wonderful, and tiny, examples of Roman glassware – which is what I’ve really come to see. I just love them. 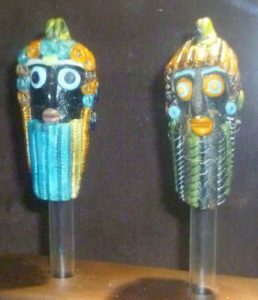 They are very small, the two heads are only about 3 inches high, and the round glass dishes, like the one depicting the cross eagle above, are the size of coffee cup saucers. What I like is that the creatures, like the coiled snake (could it be a cobra?) have such personalities. The snake, glaring with baleful eyes, looks distinctly miffed. The dots on the orangey-yellow background enhance the impression of the snake’s tetchiness. 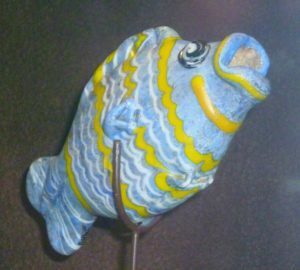 I have actually seen other, similar, examples of glass fishes – most recently, and unexpectedly, in a museum in Germany. But then, western Germany was also once part of the Roman Empire. Is this a duck? Could it be searching underwater for small creatures to eat? 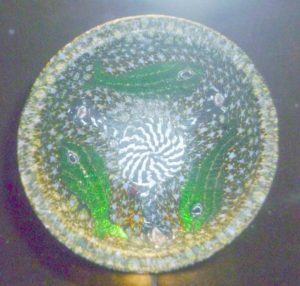 The background of this dish has a similar effect to the rods or ‘canes’ you find in 19th century Baccarat paperweights. It makes the background look like the bottom of a stream or pond. Another watery-looking scene, this time with three emerald-coloured fish. The display cases are all brightly lit from the back which make the colours glow. There is a little shop which sells very small square postcards of some of the glass dishes. But square postcards are not easy to send – by the time you’ve written the address and added a stamp, there’s precious little room for a message. I couldn’t resist buying them, but I felt a bit like Gulliver sending postcards from Lilliput. 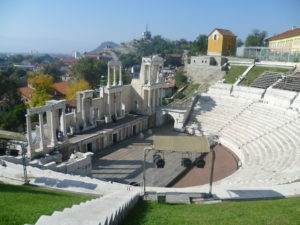 The Roman Theatre can hold more than 3000 spectators. But that’s not all Plovdiv has to offer. The Roman theatre, first built in the early 2nd century AD under the Emperor Trajan, was excavated 1968-79 and reconstructed as accurately as possible. Nowadays, it still hosts performances. 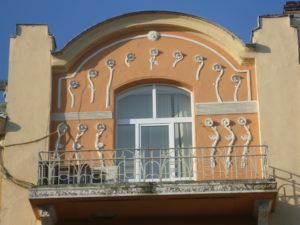 Plovdiv had a Baroque building renaissance in the mid to late 19th century. 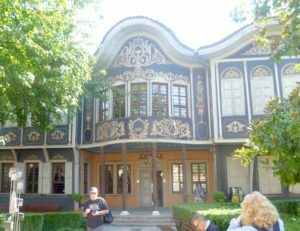 One of the most spectacular buildings from this period – and there are many in Plovdiv – is the splendid Kuyumdzhioglu House, built by a wealthy merchant in 1847. It is now the Plovdiv Regional Ethnographic Museum and it is decorated inside with elaborate floral murals and carved wooden ceilings. The house has an inner yard with a garden, a marble fountain and a well. I would have loved to have had more time in Plovdiv. It is a very attractive town, and whatever period you are interested in, there is something here for you. Interestingly, in my late 19th century World Atlas, Plovdiv is still called Philippopolis. The past is not banished that easily. Fascinating. Love the glassware. Quite exquisite and captivating. I had no idea of this history either. Thank you. Thank you for your comment, Elizabeth. 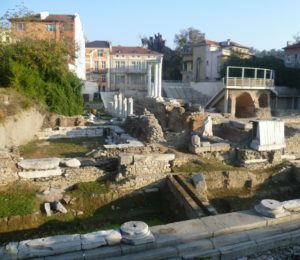 I’d never even heard of Plovdiv when I went to Bulgaria, but it turned out to be such a lively, varied and interesting place that I’d very happily go back. Your posts are always so interesting. Plovdiv looks to be a fascinating place. Thank you, Jan. Oddly enough, although I’d never even heard of Plovdiv until I got there, I had, vaguely, heard of Philippopolis (reading historical novels can do that!) but I had real difficulty in spelling it correctly when writing the post – there an awful lot of p’s. Thanks for another interesting post, Elizabeth. Bulgaria is on my wish list of places to visit. 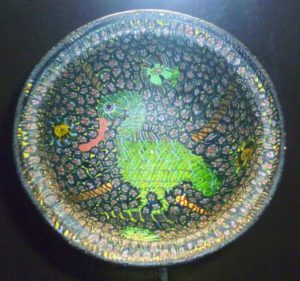 I knew there were various Roman sites there but I hadn’t seen anything about the glassware you feature in this post and it does look fun! Thank you for your comment, Gail. Bulgaria has a lot to offer, especially if you like buried treasure and archaeology. You should find my post ‘Spectacular Horses and Chariot Burial’ in the Travelling: Sites and Sights category – it’s the last one on the list, I’m afraid, but it’s there. Love how they just kept incorporating the existing features/buildings into the new buildings. Really fun pictures to look at. I’d love to see it in person. Indeed, thanks for posting about this. Thank you for your enthusiastic comment, Vicki. Much appreciated.